Cañon City offers you a warm mountain welcome! Come experience the beauty and variety of the Royal Gorge area in one of the friendliest cities in the west. Cañon City is surrounded by an abundance of breathtaking scenery, natural wonders, thrilling activities and exciting attractions. The local landscape ranges from semi-arid plains to the east to the majestic peaks and mountain meadows of the Rocky Mountains to the north, south and west. Make sure your visit includes a full menu of the area’s activities and wonders. Take your pick from the Royal Gorge Bridge and Park, home of the world’s highest suspension bridge and the Royal Gorge Route Railroad, which offers breathtaking scenery. Book a Royal Gorge fly-over with the Royal Gorge Helitours, explore the Arkansas River, or drive the spectacular Skyline Drive. Experience nature as you hike, camp, fish, raft, or rough it on an ATV tour; or visit the area’s numerous museums, art galleries, and mountain parks. Cañon City has so much to offer the traveler, whether you’re bringing multi-generations or looking for an all out mountain adventure. Cañon City’s riverwalk follows the Arkansas River for more than seven miles, winding through wetlands, groves of cottonwoods, and the John Griffin Regional Park, a nature area located in central Cañon City. An early evening stroll along the riverwalk provides a great opportunity for bird watching and wildlife spotting. The crushed gravel path is open for biking, hiking, strolling, and even horseback riding. Dogs are welcome on leash. The Arkansas River now boasts another improvement: the Cañon City Whitewater Park, part of the Arkansas River Restoration Project. This park created a whitewater kayak and recreation park near downtown Cañon City. Improvements will benefit boaters, fishermen, hikers, walkers, bikers, and runners. Cañon City’s downtown area is listed on the National Historical Register for its abundance of turn-of-the-century architecture. Submerge yourself in the ambiance of another era, even as you enjoy local dining, boutiques, music, and art galleries. 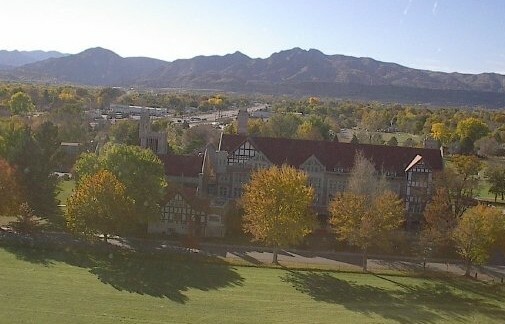 In May of 2001, a group of Benedictine Fathers dreamt of creating a fine winery on the grounds of the historic Holy Cross Abbey in Cañon City. Today, that dream is a reality. Visit the abbey’s tasting room for a memorable wine experience. During spring and summer, you will enjoy an outdoor garden setting with mountain and vineyard views. During winter, you will warm your hands by a glowing fire while sipping the abbey’s rich, full-bodied Merlot. In addition, the tasting room offers Provence textiles, exquisite Italian crystal, the latest wine accessories, and books that relate to every aspect of wine, cooking, and travel. Knowledgeable staff will assist you with your wine questions and selections. Drive your passenger car on a road that ascends and follows the top of a high razorback ridge overlooking Cañon City. Enter this one-way, paved road from US 50 on the west edge of town. Experience magnificent views from Skyline Drive, an approximately 3-mile stretch of paved road that follows the crest of an 800-foot high Dakota hogback. Soon the landscape falls away hundreds of feet on both sides, which is just a bit hair-raising! Cañon City spreads out on both sides of you and there are pullouts to enjoy the view. Towards the top, there is an interpretive display to help you see — can you believe it? — dinosaur tracks embedded in the cliff face. Stop along the way to view a series of preserved dinosaur footprints, called a dinosaur trackway, preserved in the Early Cretaceous Dakota Sandstone. Explanatory signs provide additional information for dinosaur enthusiasts. This narrow road is open year round, weather permitting. Free. A visit to the the Royal Gorge Region isn’t complete without stopping and “doing time” in this historical cell house that was the original Women’s Correctional Facility constructed in 1935, a showcase of the atmosphere and exhibits of days, staff and inmates gone by. The Fremont Center for the Arts has monthly gallery exhibits, a permanent art collection, an extensive art library and gift shop, all located in the historic post office. The Royal Gorge Regional History Museum is a research library offering family files, newspaper microfilm, oral histories, photographs and archives. As well as, Dinosaur exhibits featuring some local artifacts and a wonderful interactive area for young children to discover their own dinosaur bones. At the most visited theme and wildlife park in Colorado’s Pikes Peak region, you can experience the rush of the historic Royal Gorge Bridge, a quarter-mile long span of planks and galvanized wire. This engineering marvel hangs 1,053 feet above the spectacular scenery of the Royal Gorge, providing a view you can get nowhere else. Hanging high above Colorado’s wild Arkansas River, The Royal Gorge Bridge is America’s Highest suspension bridge and a legendary feat of engineering renowned the world over. Built in 1929 for 350,000, the cost today would easily exceed $20 million. It was a world wonder then and still is today. For those who venture across it, the experience is priceless. The new Visitor Center is perched on the very edge of the Royal Gorge’s north rim, the Visitor Center and deck gives the faint of heart solid ground for awesome views of the natural wonder. Inside the Visitor Center you will find Cafe 1230′ and large gift shop. Don’t forget all of the great attractions: Plaza Theater, Tommy Knocker Playland, Gondola, Cloudscraper Zip Line, Royal Rush Skycoaster. Welcome aboard the Royal Gorge Route! Welcome aboard the Royal Gorge Route Railroad-simply the best way to experience the Royal Gorge and all it has to offer. The railroad tracks were laid over 120 years ago, however, passenger service was cut off in 1967. In 1999, passenger service returned and now provides visitors from around the world 12-miles of unforgettable scenery, coupled with exceptional service and memories to last a lifetime. The 12-miles of track follow the most spectacular section of Denver & Rio Grande Railroad directly through the Gorge. Passengers may choose from Coach, Parlor and Bar car, or Vista Dome seating, along with famous Premier Dinner and Murder Mystery classes of service. The train consists of climate controlled coaches, first-class cars and open-air cars to watch the passing scenery. Riders often spot wildlife: ducklings on the river’s quieter stretches, mule deer on far meadows, bald eagles, and Rocky Mountain bighorn sheep. The scenery is breathtaking, on one side, the Gorge’s granite cliffs rise 1,000 feet; on the other rushes the Arkansas River. The journey through the Royal Gorge lasts 2-hours, covering a distance of 24-miles. No trip to Royal Gorge Country is complete without experiencing the world famous Arkansas River. This Colorado jewel offers everything from a mild and enjoyable family trip through Bighorn Sheep Canyon to the world-class whitewater excitement of the Royal Gorge. The area’s professional rafting outfitters will provide a trip that suits your skill level and taste for adventure, whether you desire the adrenaline rush of a full paddle-boat experience or a peaceful oar-boat excursion. So, you’re ready to enjoy a half or full day of rafting on the Arkansas River? You should choose a trip based on the age and experience of the participants (particularly children), level of difficulty, length of trip, your physical condition, experience of the outfitter, and type of raft, either paddle or paddle-assist. Paddle boats require more participation than paddle-assist. The Arkansas River is America’s most popular rafting river. In the Royal Gorge Region there are trips ranging from gentle floats to family fun to white-knuckle whitewater. Water levels vary throughout the rafting season and affect the difficulty of the rapids. Knowledgeable outfitters will help you make the right choice. Several rafting companies offer a combination train trip and rafting package. The Royal Gorge Region has a number of highly qualified outfitters who specialize in tailoring trips to your particular wishes and abilities. Enjoy a thrilling and exhilarating adventure that races across the Royal Gorge plateau or near the Arkansas River where you will have classic Colorado views of the adjacent 14 thousand foot peaks of the Sangre De Christo mountain range and the surrounding area. Along the tour you will be able to take advantage of easy paced hiking trails where your guides will teach you about the areas local history and terrain. A few of the trails takes you along Colorado’s historic Stage Coach road, a place where the settlers long ago forged their way through Colorado’s untamed and Wild Western landscape. Adrenaline meets beauty, While zipping along you will be able to reach speeds of up to 55+ mph on up to 20 cables. The longest zip line of the Classic Course is the 9th and final zip, a dual side by side 1002 foot racing zip line that will allow you to challenge your friends with a race to the finish! The Extreme Zip Line course boasts a line of over 1/3rd of a mile at 1700 feet! These amazing adventure tours that are absolutely not to be missed. Royal Gorge Country is an exceptional place to camp with gorgeous views and lovely weather. The area offers a wide range of private, city, state and national campgrounds, with facilities ranging from cabins to full hookup RV sites to tent campsites. The Arkansas River offers the best fly fishing in the southern Rocky Mountain region. Excellent public access, gorgeous weather, and the sheer numbers of fish make the stretch of Arkansas River from Howard to Texas Creek a favorite fly fishing location. There you can cast for wild Brown Trout in the company of big horn sheep, eagles, and other wildlife. Book a guided fishing trip with local anglers and outfitters, brush up on your fly fishing skills with a class, or head out on your own for some riverside solitude. This 131-mile circuit begins and ends near Cañon City and includes some of the most incredible scenery in Colorado. Explore old mining camps, fossils and the picturesque Royal Gorge. Twelve miles north of Cañon City, the Shelf Road Recreation Area offers world class rock climbing. Five limestone canyons hold more than 700 climbing routes, designed and maintained by national and international climbing experts. Beautiful scenery, inexpensive campsites, and several miles of foot trails attract hikers, mountain bikers, ATV-ers, and horseback riders as well as 32,000+ climbers per year. Whether you’re looking for a leisurely stroll or a pulse-raising workout, you can find a trail to suit your needs. About seven miles out of town, the moderate Stultz Trail serves horseback riders and mountain bikers as well as hikers; or venture a few more miles to the more challenging Tanner Trail for more spectacular mountain views. The narrow Tunnel Drive is a hiking trail in the foothills west of Cañon City. These and other area trails attract hikers, mountain bikers, and horseback riders year-round.